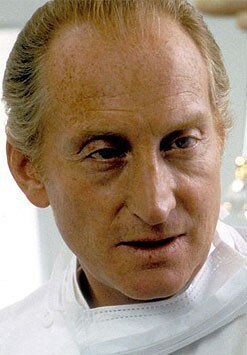 British stage and film actor Charles Dance joined the Royal Shakespeare Company at age 29 and made his first film at age 35 in the James Bond picture, ”For Your Eyes Only” (1981). Three years later, he went to the spotlight for his BAFTA TV-nominated role of Sgt. Guy Perron in the Golden Globe-winning British television miniseries “The Jewel in the Crown” (1984). Dance later became widely remembered as D.W. Griffith in ”Good Morning Babylon” (1987), Meryl Streep’s husband in ”Plenty” (1985), the title role in the TV adaptation of ”Phantom of the Opera” (1990), and the displaced “imaginary” villain in Arnold Schwarzenegger’s ”Last Action Hero” (1993). He also starred in “Kabloonak” (1995), “The Blood Oranges” (1997), “Hilary and Jackie” (1998), “Dark Blue World” (2001), “Gosford Park” (2001), “Ali G Indahouse” (2002), “Bleak House” (2005; miniseries), “Scoop” (2006), and “Starter for 10” (2006). Dance was awarded the O.B.E. (Officer of the Order of the British Empire) for his services to drama in the 2006 Queen’s Birthday Honors List. The 6′ 3″ sandy-haired British player divorced his wife of 34 years in 2004. The father of two recently made headlines for his brief relationship with British actress Sophia Myles, who is 40 years his junior.